My name is Lene Krone (previously Lene Jensen). I was born in 1968 in Norway. Since I was 12 horses has been my life. I started out with taking English pleasure classes. Soon I got into harness racing. I've been involved in trotting some way or another since 1983, as groom, owner, race-course staff and in administration. I also have a 2-year Equine College education. I have a Master of Science Degree in Business, and am working in the administration of the Norwegian Jockey Club (Norway's only TB Race Track) . I have also been involved in harness driving since 1987, taking many courses including being a judge at harness driving events. In the Winter Olympic Games in Lillehammer 1994 my Fjord Horse and I participated in the opening ceremony. I've been interested in natural horsemanship since 1993. As time passes by, my interest in the behaviour of horses and how to communicate effectively with them, just increases. My significant other since 1994 was Alf Sæle. He spent most of his life with horses, training and shoeing harness racing horses and also driving in the races. He was also committed to natural horsemanship principles. He also converted to barefoot trimming. Alf passed away in 2015. In 2018 I remarried to Peter Krone who is coming from a background of natural therapies. He is very interested in the horses and take part in the daily care. The 24. November 2000 three Curly horses took their first steps on Norwegian soil. That marked the beginning of Curlies in Norway, and the end of a long process for me, a process that started 4 ½ years ago. I'd been into horses for almost twenty years, with racing, driving, riding, breeding etc., but I developed an allergy that made it difficult to work full time in the stable anymore. 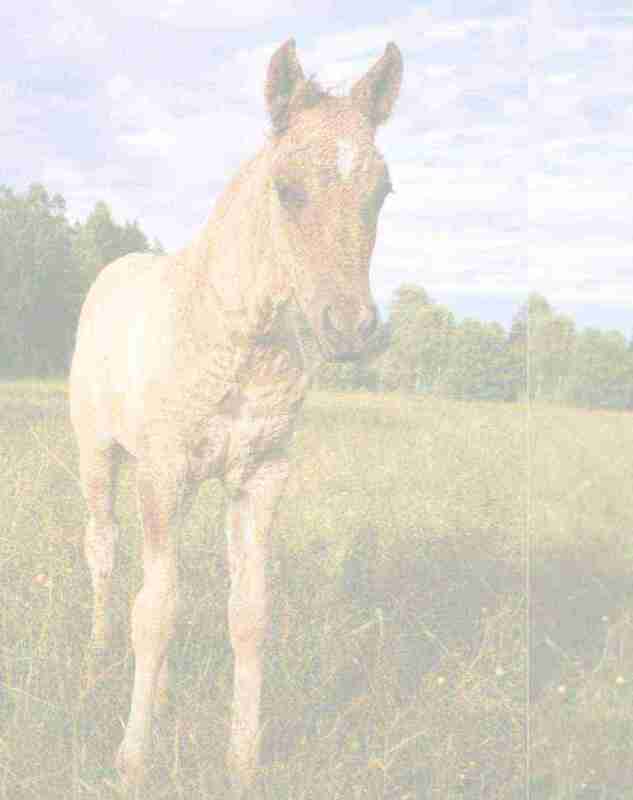 After I in 1996 accidentally saw two Curly horses in Sweden, I started investigating about the breed on the Internet. I got in touch with the Swedish American Curly Horse Association, and in 1998 we went on a little “Curly tour” in Sweden, visiting a number of breeders and seeing their Curlies. I was thrilled about my almost non-existent allergic reaction. But there were no mature horses for sale. I decided to find horses in North America. I bought the ABC stud books in the fall 1998 and started reading, educating myself on the bloodlines. I picked out all the mares in the studbooks that met my requirements regarding pedigree and age, and started to track down where they were. When it came time to go to USA I had a small number of mares that were for sale to choose from. It was not easy to make the selection, but I ended up with the three mares which I am very satisfied and happy with. I also looked on a number of stallions and chose some that were suitable for the mares to be bred to. Three pregnant mares went into quarantine in the fall of 2000. Ufortunately one absorbed her fetus, but arrived Norway in good condition along with the other two. These were the first Curlies in Norway. Later we have bought more Curlies, from Sweden and USA, and also bought an own farm, so we have a small herd now. We think the horses should be in a safe and stable environment taken care of by somebody who really cares for them, as we think horses can understand whether they are loved and wanted. We keep our horses together in a fairly large pasture with varied terrain. They have free access to a nice and dry shed where they can eat, drink and sleep as they like, and have shelter for the weather. I am almost a perfectionist when it comes to good horse care. Our mares get high quality feed, in amounts calculated according to the needs. Their health are taken care of by a experienced vet. They are monitored when foaling time approaches to ensure both the mares' and their foals' health. Deworming, floating of teeth, vaccination and foot care are done according to expert advice. The mares and their foals are taken care of and trained using natural horsemanship philosophy. This means that no violence is used, and safety and communication is priority one in the training. We imprint train the foals. Our farm is open for guests, both for trail riding and horse contact. Especially allergy sufferers, disabled people and people with back problems will here find something that is unik in Norway. Guests will always get proper training and supervision when in contact with the horses.